Who would have thought at the beginning of this story that two worlds so different would complement each other so well? well my dear friends yes, this original series of spies “Terius Behind Me”, that has received so many good reviews and has had a great acceptance by all viewers reached its end last November 15. In the chapters broadcasted on Wednesday by MBC, there were many loose ends to tie up, the traitor Director Shim Woo Cheol, who had always been the infiltrator in the NIS, was making his escape along with the secretary of the presidency and the much sought-after “The Voice”, head of the International Military Complex-Industrial Cornerstone, Yoo Chun Sang. In addition, Detective Yoo Ji Yeon was unconscious after the emergency surgery and Kim Bom was back, active as a member of the NIS. This whole series of dramatic, action-packed events prepared us for their two shocking final chapters. But first, let’s talk a little about this drama in general. The story tells the union between Go Ae Rin, a woman who unexpectedly lost her husband, and Kim Bon, a former agent of the NIS organization, who lives hidden from the world. Go Ae Rin, is a woman dedicated to the care of her children, Cha Joon Soo and Cha Joon Hee and of her husband Cha Jung Il. Ae Rin leads a normal life as a wife and mother, however, when her husband dies she has to find a job that allows her to support her two children. Kim Bon is her mysterious neighbor, who in the past during a secret operation lost her beloved. 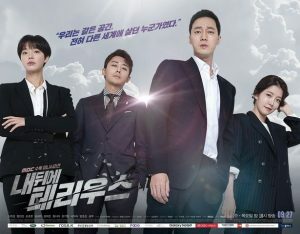 In her job search Go Ae Rin goes to work for “J International”, a suspicious company whose representative is Jin Young Tae, a handsome and arrogant man who unexpectedly is the key to solving the conspiracy in the capture operation of the nuclear physicist Choi Yeon Kyeong, in which operation Kim Bon lost the woman he loved. Upon realizing this and that the death of his neighbor’s husband is related to the same organization, Kim Bon decides to become the private nanny of Cha Joon Soo and Cha Joon Hee, in order to keep the family under surveillance, obtain the necessary information and solve the mystery. As the story unfolds. Go Ae Rin gets herself into a lot of trouble product largely of her own curiosity, but thanks to Kim Bon and that she is a very clever woman managed to get ahead together, always counting on both the help of the KIS organization and the agents of NIS, Yoo Ji Yeon and Ra Do Woo. “Terius Behind Me” is a drama that involves spies, action, drama, revenge, romance, and comedy. It seems too many elements to work in a drama but the real charm of “Terius Behind Me” is that each and every one of those elements works in harmony. The moments of comedy, are well done and are not misplaced, the action, the drama even the romance is all at its point and in its right measure. In the case of “Terius Behind Me” worked. the proposal of an elite agent in the world of a mother and a mother in the world of spies was excellent, one of my favorite dramas of the season. So Ji Sub played a great role as the super agent of the NIS, who in addition to handsome, was the best babysitter in the world. To So Ji Sub I have nothing to reproach to him, he fulfilled all the expectations, in his action scenes, in his dramatic scenes, in the chemistry with the children, everything in his interpretation was precise, in general, he had an awesome comeback that undoubtedly all his fans appreciated. But So Ji Sub wasn’t the only one who stood out, Jung In Sun plays super mom Go Ae Rin. Jung In Sun played a character with an innate ability to get into trouble, an excellent mother and a kind of support agent. The other characters in the cast were up to the task, Jin Young Tae played by the handsome Son Ho Joon is one of the characters I liked the most, and it’s worth mentioning that all the theatre they staged for his death was definitely sold, seriously I was totally deceived, in my mind I said: well this gives more realism, but when he later appeared with his new identity and trying to have a normal and quiet life, my heart felt much better. Im Be Mi as Yoo Ji Yeon and Kim Sung Joo as Ra Do Woo. They were credible NIS agents, what I liked most about them, was how their romance was developing, they were very funny, but at the same time tender. Their romance was cooked little by little, it was evident that they were going to end up together but they didn’t force it. Now let’s talk about KIS (King Castle Information System), a group made up of the residents of the King Castle apartment where information is shared to maintain the security of the complex. The characters of Kim Yeo Jin as Shim Eun Ha, Jung Si Ah as Bong Sun Mi and Kang Ki Young as Kim Sang Ryul and members of this particular group, are a complete madness, they are the characters that contribute the most with the comedy, their scenes are to die of laughter. Finishing with my criticism of the characters, I would like to mention Seo Yi Sook as Kwon Young Sil. This experienced actress convinced with her performance as the agent in charge of justice, at first she was the clear suspect of being the informant of the NIS, then in the last chapters, you can see that she simply wanted to assert justice and was misinterpreted. On the other side, Uhm Hyo Sup as Shim Woo Chul, one of the characters that have more importance in the plot, his performance was not so convincing. His character had to give that assurance that he was the boss in charge of the NIS, but he did not and when it turned out that he was the evil villain behind everything, it was already too late for his character to somehow impress the audience, his best scene was undoubtedly when he put the gun to the head of Yoo Chun Sang (Im Byung Ki). Now let’s talk about the end, a final that took many by surprise, but thinking about it, it was a very “Terius Behind Me” ending. The Deus x machina did not fail in this drama, everything was solved thanks to the deus x machina, in the end, the villain was not caught by a great, super detailed plan, instead, everything was the product of a huge coincidence. About the romance…If you people were in the mood for more romance between Kim Bon and Go Ae Rin, I’m afraid it was only left only to the imagination, when at the end of the episode we thought they were in that long-awaited first date, they only lets our creativity fly and imagine these two characters together in the future. Although I really wanted to see more romance between them, the ending for these two characters was the right one and left a warm feeling in our hearts. My only complaint is that I would have liked to listen a little more the soundtrack during the drama since is excellent! Needless to say, I hope you enjoyed this drama as much as I did and if you haven’t seen it, I totally recommend it! Don’t miss Kim Bom and Go Ae Rin, two people who will have to start living in worlds different from their own. In a drama full of action, spies, conspiracies, children, nannies, and friends, that will give color and entertainment to your life.